Raj Mukherji is a founding partner of the firm. He brings to his practice significant organizational leadership experience in management settings (in the public sector as well as in healthcare and as a former technology CEO). He also serves as a municipal prosecutor. Prior to his Bar admission, Mr. Mukherji was a founder and Managing Partner of a government affairs firm that he grew into the state’s third largest lawyer-lobbying firm (according to the NJ Law Journal), where his clients included Fortune 500 corporations, financial institutions, hospitals and other healthcare institutions, government agencies, labor unions, social justice causes, higher education institutions, and others. Mr. Mukherji successfully facilitated complex healthcare transactions, including the sales of nursing homes and hospitals. Prior to that, he served as CEO of an Internet consulting and software development company, which he sold in order to enlist in the Marines two weeks after 9/11 at age 17, where he served in military intelligence for the U.S. Marine Corps Reserve. At 24, Mr. Mukherji was appointed Commissioner and Chairman of the Jersey City Housing Authority, the youngest in city history. At the state’s second largest public housing authority, he earned nationwide acclaim for his oversight and various reforms at the $75 million agency serving over 16,000 residents and over 6,700 households. At 27, he was appointed Deputy Mayor of Jersey City. In that capacity, he helped to run New Jersey’s second largest city – commonly dubbed “Wall Street West” and the economic engine of the state – with a municipal operating budget of nearly $500 million and a workforce of over 2,600. In 2013, Mr. Mukherji was elected to represent Hudson County in the NJ State Assembly. In 2018, he was appointed Majority Whip of the General Assembly. Assemblyman Mukherji was named “New Jersey’s most prolific lawmaker of 2016” by POLITICO because he was a primary sponsor of more bills signed into law than any other legislator in the state. In the Legislature, he sits on the Assembly Budget Committee, responsible for crafting the state budget (approximately $34 billion in FY 2016), and serves as Vice Chairman of the Consumer Affairs Committee. He previously served for four years on the Commerce and Economic Development and Labor Committees. His bills have focused on economic development and job creation; protecting seniors and expanding their access to healthcare and essential services; infrastructure; public safety; veterans; social justice; addiction prevention and treatment; and a myriad of other issues of importance to his constituents. He was named the Assembly’s “Humane Legislator of the Year” recipient for 2015 by the Humane Society and 2015 Legislator of the Year by the NJ Law Enforcement Police Officers Brotherhood. Assemblyman Mukherji was also named a 2015 honoree of the Boys & Girls Clubs of Hudson County for championing the expansion of teens’ access to mental health services, and he received the 2015 Legislator Award from the NAACP for his civil rights advocacy. He was the 2017 recipient of the Mortar & Pestle Award from the NJ Pharmacists Association, awarded annually to a non-pharmacist with the greatest contributions to the profession of pharmacy and the public. 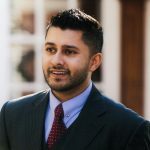 As a recipient of the Professor James B. Boskey Award, Mr. Mukherji completed the Harvard Negotiation Institute’s Intensive Negotiations for Lawyers and Executives program at Harvard Law School. He has taught Constitutional Law as an Adjunct Professor at New Jersey City University and has guest lectured at Georgetown University Law Center and Rutgers School of Law—Newark.